For decades, Joanne Kyger has played a crucial role in California’s poetry scene. Her poetry has been influenced by her studies in Zen Buddhism and her connection to the poets of Black Mountain, the San Francisco Renaissance, and the Beat Generation. This review is about 3 printed pages long. It is copyright © Jane Falk and Jacket magazine 2007. I first opened Joanne Kyger’s About Now, at the Mandeville Special Collections, University of California, San Diego, home to Kyger’s archive. Reading her first complete collection of poems with such a backdrop was a serendipitous experience. The recognition of her early promise in letters from mentors Robert Duncan and Philip Whalen is fully realized here, in a volume covering an approximate fifty-year poetic journey. About Now begins with poems of the 1950’s, written when Kyger first came to San Francisco and joined the circle of poets around Robert Duncan and Jack Spicer, and ends with Night Palace, poems written in 2003 to 2004, published just last summer and handed out by Kyger at the celebration of a lifetime achievement award given her by Small Press Traffic in San Francisco. The volume is organized chronologically, an important way to approach this body of work because she dates many of her poems and obviously finds time and its passage of importance. Consider, for example, her use of the journal as poetic genre in a work like Desecheo Notebook or The Wonderful Focus of You. Adding to the volume’s handsome appearance is the inclusion of illustrations from early books such as Places To Go, as well as other drawings of Kyger and her milieu by Arthur Okamura and Donald Guravich. This long-awaited collection enables the reader to discover out of print or hard-to-find works such as Patzcuaro, The Dharma Committee, or Some Sketches from the Life of Helena Petrovna Blavatsky, as well as previously unpublished poems with which the volume begins. It is true that Kyger has had a selection of her poems published recently; As Ever (Penguin, 2002), provides access to some early works such as Joanne or Places To Go. However, About Now supersedes this providing access to all of Kyger’s work, including chapbooks published since the turn of the millennium: The Distressed Look, God Never Dies, and Night Palace. Reading these poems alongside her correspondence seems apt because as readers discover, much of Kyger’s poetry is grounded in her everyday experience, the theme and variations of a life lived in recognition of the present moment and its magical simplicity. What is exciting about Kyger’s poetry is the way she highlights moments which might seem mundane, but under her perceptive eye connect the individual with a greater reality, opening readers’ awareness in the process. That immersion in the details of everyday life, quail crossing a yard, a phone call from a friend, or a retelling of last night’s dream, is plumbed by Kyger to great depth and is epitomized by the collection’s title, About Now. Her poems, similarly to her letters, also speak of the place from which she writes to friends across a varied spectrum of the poetry world from Bay Area Beats and Renaissance poets to Second Generation New York School poets. Reflecting a life lived with a foregrounded sense of place and a crossing of borders and schools, these poems are in a sense picture postcards, a point aptly brought to readers’ attention both by Ron Silliman’s comments on the back jacket of About Now and Linda Russo’s insightful Introduction to the work. Russo discusses the spiritual, ecological, and formal aspects of Kyger’s poetics. In particular, she notes Kyger’s experimentation with the line, its vitality and expressive potential to mirror for the reader the poet’s voice. Deriving from an early interest in Charles Olson’s “Projective Verse,” this remains a constant feature of her work. 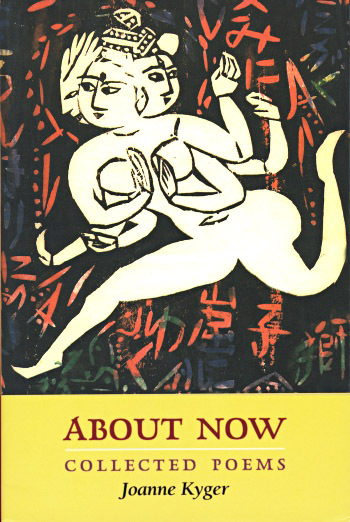 This collection also allows readers to survey Kyger’s poetic personae and evolving Buddhist perspective. An early interest in what Robert Duncan, introducing her at the 1965 Berkeley Poetry Conference, called the most important job of a poet, bringing the old stories up to date in present time, is expressed throughout her career: The Tapestry and The Web’s retelling of Homer’s Odyssey; “Descartes and the Splendor Of,” Kyger’s version of Descartes’ Discourse on Method; or her poems on the Buddhist spiritual teacher, Naropa, for example. Reading through About Now also provides a renewed appreciation for Kyger as social commentator. Her anti-war stance is evident both at the beginning of the volume with direct or oblique reference to the Vietnam War and in more recent poems which protest and address the war in Iraq. Feminist preoccupations have been a focus as well, an early and significant example being “The Pigs for Circe in May.” One of her amusing and astute critiques of American contemporary life is “Watching TV,” where Kyger’s tone moves between the serious and the humorous, a hallmark of her style. One criticism of this collection, however, is its lack of a true bibliography. The list of previously published books by Kyger that begins the volume is simply not enough for the scholar or even casual reader who would like to know more publication details for the volumes collected here, especially those from small presses. Adding such specifics would have allowed readers to better see connections between her various communities. The fact that Joanne was published by Anne Waldman’s Angel Hair Books lends an added dimension, and the reader can better connect Kyger with this group of younger New York School poets. As well, a rationale for About Now’s six chronological divisions would have been welcome because sections are not always strictly by decade, leaving readers puzzled by a seemingly arbitrary organization. Despite these minor criticisms, About Now is a significant event, not only for Kyger’s recognition as a poet of stature, but for readers and lovers of poetry. Opening this collection to any page is to sample a master poet at work. Nothing superfluous here: the single right word expressing the passing moment; the tone often playful; and the voice, to even a silent reader, nuanced with perfect pitch. 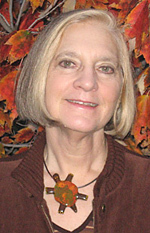 Jane Falk is Lecturer in English Composition at The University of Akron, Akron, Ohio. She has contributed an appreciation of Philip Whalen’s The Diamond Noodle to Continuous Flame, a tribute volume to Whalen, as well as biographies of Whalen to the Encyclopedia of Beat Literature and forthcoming Greenwood Encyclopedia of American Poetry. Her essay on Zen influences on Whalen’s poetry will appear in The Emergence of Buddhist American Literature from SUNY Press. Current research interests include the work of Joanne Kyger and Lew Welch.